We're lucky enough to have two lovely dogs as part of our family, and I don't know about your dogs but mine often become less excited about their food the more they eat it. The only time I've ever really seen them get excited over their food was when I used to make them up a raw batch of chicken wings and other meats. I did this before the toddler arrived but I found myself with less and less time to make the actual food so I ended up switching to dry kibble. As you can imagine it's not all that exciting for my two pooches and they often got fed up with it. This is were PURE comes in. PURE are a naturally dehydrated pet food brand whish is made with nothing but fresh and raw ingredients in a human grade food facility in the UK. It's prepared with a gentle method called dehydration and means the moisture is removed from the food, locking in the nutrients and goodness whilst preserving them. 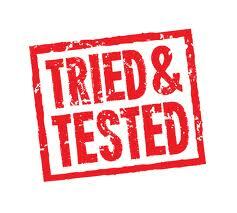 I'll let PURE explain further: "Our dehydrated meats are lightly heated at around 90c, just enough to remove any harmful pathogens whilst preserving the nutrients without the need for harsh cooking processes. They are then carefully dehydrated to remove the moisture, leaving the meat you find in Pure packed with almost 300% more protein than you would find in fresh meat." My two dogs, Lexie and Tulli, were lucky enough to receive 2x tasty 4kg boxes of dog food. When you add water to each 4kg box it actually equates to 16kgs in fresh food which is amazing. 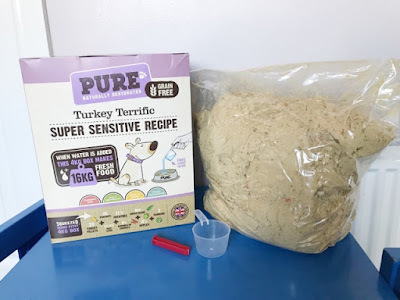 I received the Turkey Terrific which has a super sensitive recipe, great for my Lexie who has major skin problems. I also received the Chicken Dinner which is perfect for picky and sensitive dogs. Excellent for Tulli then as she sometimes turns her nose up at food. I started out with the Turkey Terrific and I can honestly say it went down a storm! It was like I was feeding the girls raw food again. I haven't seen them get that excited about food in a long time. Inside each box you get a food scoop and a bag clip to keep the dehydrated food fresh and moisture free when not using it. There's a big list of instructions on the back of each box which looks daunting at first but after making the food a handful of times it became second nature and I didn't even need to look at the instructions. You basically use the provided scoop to measure the amount of dog food you'll need (using the guide provided). 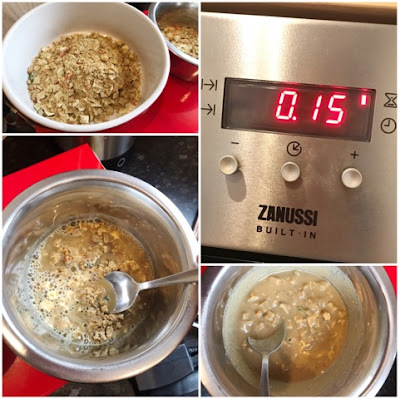 Then you add warm water (as per the guide) and stir altogether before leaving 10-15 minutes to rehydrate. Waiting was the hardest part for my girls and if you've ever heard a Staffordshire Bull Terrier cry well that's all I got for 15 minutes solid. It's well worth the wait though. After using the food for a month I felt that Lexie's skin looked a lot healthier and she had a bit of a glow about it. She definitely looked forward to every meal time and reminded me frequently when dinner time was drawing closer. Tulli never turned her nose up at her PURE dinner either and scoffed the lot. I've never seen a cleaner bowl, it was licked spotless every time. The price for the Turkey Terrific flavour 4kg box of food is £59.99 and it's £49.99 for the 4kg box of Chicken Dinner. I think the pricing is very reasonable and totally competitive considering these boxes rehydrated to 16kgs worth of fresh food and a bag of 15kg dry food from some brands is between £40-£50 in the pet shops. So would I recommend this dog food? I totally would, I didn't have any issues with the girls being on the food and they really enjoyed it. In fact they loved it! 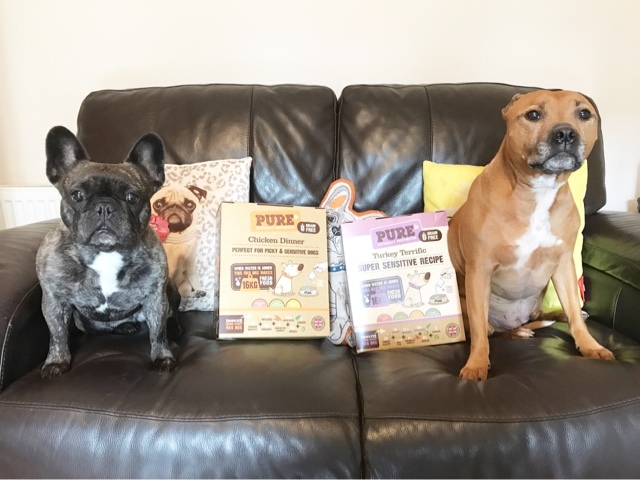 I was sent 2x 4kg boxes of PURE dog food to try in return for an honest review. 11 comments on "Review: PURE Pet Food"
I saw this advertised recently and was curious as to how it was! Our dog will eat just about anything but it's great you noticed changes in your dogs from having this. I might try it! I don't have a dog but thats great that you've noticed a difference! Aah, your dogs are SO cute, I love dogs - we have a black lab, Robbie! That's great you noticed a difference after changing their food. We have to keep Robbie on the same food all the time as his skin will flare up if we give him something different! Despite living on a farm we don't have a god, this looks a great recommendation to those who do though. Such cute pups! This looks great! I used to find I had to alternate the food I gave my dog so he wouldn't get bored with it.